RONJ-BLOG: [did you know?] Zapote, the fruit. Today, I attended Japanese language lessons and we were in a conversation about favorite fruits. One of the Indian students asked me if I know the fruit called sapota. I told him, no, of course, and that I don't think there's any word in English like so. I tried to think that there might be a word very similar to sapota which could explain what it is. But when I looked up both Japanese and English dictionaries I had, there was no word like sapota. The closest I saw was probably the word sapodilla, which is basically like a Spanish word. I finally was able to google sapota. It turns out, it is the Tamil (South Indian) word for the Filipino word, chico. Yes, the fruit. It turns out the Hindi word for it is chiku. If the Indian guy had asked me if I knew what is chiku, maybe I would've been able to guess what it was earlier. It turns out that chico originated from Mexico and Central America, where they might also call it chicozapote. In other Spanish-speaking countries in Central America, they call it zapote. And there you go. Obviously it was only introduced in the Indian and Southeast Asian sub-continent. As for me, it has been a very long while since I last tasted chico. Not something I really like to do, though. But from what I remember, it's quite a tasty fruit. 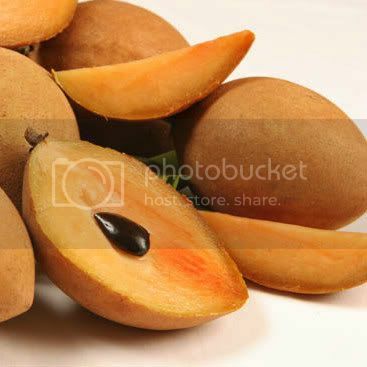 As I mentioned, it is also known as sapodilla, at least maybe around the US. For more info, check out the Wikipedia article about this.